To pack solid bulk materials safely and conveniently, we provide an extensive range of jumbo bags that are widely valued by our customers. Manufactured using quality material, these jumbo bags are extensively used for packing sugar, grains, and other granular items. We provide anti bulging jumbo bags with anti-bulging function that comprises of a bag inside a box in which an inner bag is set in an octangular inner cylinder integrated with a quadrangular outer casing. The bag inside the box provides an anti-bulging function to prevent the outer casing from bulging. 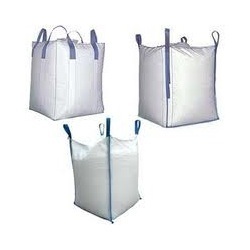 These bags are mostly used to pack and store granules. We offer these bags in various sizes and can be customized as per the client's requirements. Looking for Jumbo Bags ?